Distortions, related to astigmatism , that cause the inability of light rays entering the eye to converge (come together) to a single focus point on the retina . Aberration are divided into two main categories: higher-order and lower-order. Ability of the eye to change its focus between distant objects and near objects. This term describes a visual field defect in which either the upper or lower half of the visual field is selectively affected. The selective abnormality often creates a horizontal line across the visual field (known as "respecting the horizontal meridian"). 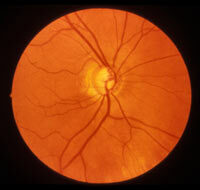 Altitudinal defects occur in retinal vascular disease, glaucoma, and other disorders that affect the eye itself. Dullness or obscurity of sight for no apparent organic reason, therefore not correctable with glasses or surgery. Sometimes called a lazy eye, wherein one eye becomes dependent on the other eye to focus, usually developed in early childhood. Often associated with strabismus. The conditions that most commonly cause amblyopia are eye misalignment (strabismus), a significant difference in spectacle prescription (refractive error) between the two eyes (anisometropia), or interruption of the light path of one of the eyes (by cataract, scar, tumor, etc.). If amblyopia is not treated before the age of 8, the visual deficit is usually permanent. Hand held chart featuring horizontal and vertical lines, usually white on black background, used to test for central visual field defects. Drainage area of the eye formed between the cornea and the iris , named for its angular shape, which is why you see the word "angle" in the different glaucoma names. Condition of the eyes in which they have unequal refractive power. Space between the cornea and the crystalline lens , which contains aqueous humor . Part of the eye anterior to the crystalline lens , including the cornea , anterior chamber , iris and ciliary body . Transparent fluid occupying the anterior chamber and maintains eye pressure. A modified form of Radial Keratotomy (RK). Structural defects of the eye in which the light rays from a viewed object do not meet in a single focal point, resulting in blurred images being sent to the brain. An astigmatic cornea is not perfectly rounded like a basketball but has an irregular shape more like the side of a football. Astigmatism is most often combined with myopia or hyperopia . These are visual field defects that extend from the central vision to the natural blind spot. This type of field defect usually represents an insult to the cluster of retinal ganglion cells called the papillomacular bundle. A redundant folds in the conjunctiva typically located between the globe and the lower eyelid. Loose bulbar conjunctiva that may become pinched between the lids and cause tearing and inflammation. Frequently age-related. Usually found along the lower lid margin. It interferes with the normal distribution of tears causing dry eye and epiphora. An enlargement of the cup or central depression in the optic nerve head. Cupping is visible when viewing the back of the eye with an ophthalmoscope. An enlarged cup especially if accompanied by a notch or a small spot of bleeding is a sign of glaucoma. Cupping is a clinical sign that indicates that a large number of nerve fibers in the optic nerve have been lost. Complete color deficiency affecting the ability to see the color green. There are three possible color vision deficits: red (protan), green (deutan), and blue (tritan). The suffixes –omaly and –opia indicate partial and complete color vision deficits, respectively. Therefore, a person who has deuteranopia has a complete green color deficit. A general term for color vision abnormalities. Heritable dyschromatopsias include red (protan), green (deutan), and blue (tritan) color vision deficits. These deficits may be partial (-omaly) or complete (-opia). Red and green color vision defects are X-linked while loss of the blue receptor (tritanopia) is inherited in an autosomal recessive fashion. A test that measures the electrical activity of the retina when exposed to flashes of light of varying intensity. Abnormalities in the electroretinogram typically occur in conditions that affect the photoreceptor cells (e.g. retinitis pigmentosa). Excessive tear production or insufficient tear drainage from the eyes (usually from blockage of the lacrimal duct) causing overflow of tears onto the face. In the human eye the term fovea (or fovea centralis) is the "pit" in the retina that allows for maximum acuity of vision. The human fovea has a diameter of about 1.0 mm with a high concentration of cone photoreceptors. The center of the fovea is the foveola – about 0.2 mm in diameter – where only cone photoreceptors are present. The central fovea consists of very compact cones, thinner and more rod-like in appearance than cones elsewhere. Starting at the outskirts of the fovea, however, rods gradually appear, and the absolute density of cone receptors progressively decreases. Glaucoma in which the intraocular pressure is normal but there is progressive optic nerve damage and visual field loss. Also known as Low Tension Glaucoma. A type of vision test in which progressively dimmer lights are moved from the peripheral vision into the central vision, using an instrument that allows the point at which the light is first seen to be accurately mapped. In this test, a trained perimetrist moves the stimulus; stimulus brightness is held constant. The limits of the visual field are mapped to lights of different sizes and brightness. Also known as Goldmann kinetic perimetry. The concept that even though several members of a family or population may have the same DNA mutation, not everyone with that mutation will have or develop the disease. This is in contrast to variable expressivity which means that people with the same disease have varying disease severity. Penetrance, in contrast, is more of a yes/no question – does or does not the person have the disease. A line connecting a series of points in a visual field at which a person is able to detect a certain size and intensity of light. Isopters in normal visual fields are oval in shape. A disease entity that most commonly affects young men in their teens and early twenties and causes significantly decreased central vision in both eyes. The genes that cause LHON are carried on small circular mitochondrial DNA molecules that are inherited from an individuals mother. This condition is extremely rare (affecting fewer than 1 per million people per year) and does not affect everyone who harbors the genetic defect. The visual field defects in LHON are typically cecocentral scotomas. There are three other eye diseases named after Theodore Leber: 1) Leber congenital amaurosis (blindness at birth) inherited in an autosomal recessive fashion, 2) Leber's stellate neuroretinopathy (a non-heritable condition associated with cat scratch disease) and 3) Leber's military aneurysms (a non-heritable vascular malformation of the retina similar to Coat's disease). A device that used to determine degree of red or green color vision deficit. A dial on the anomaloscope is adjusted until the viewer (patient) believes that the green-red balance is appropriate compared with a standard yellow light whose intensity can also be varied. 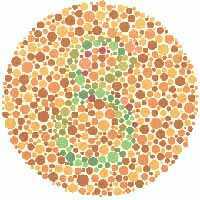 When a person with normal color vision views the "match" made by a patient with abnormal color vision, a deficit in either red or green color vision is readily apparent. Proper alignment of the two eyes. Absence of eye deviation. A collection of retinal ganglion cells that carry the information from the macula (the central retina) to the optic nerve and on to the brain. If damaged, central visual field defects occur. Thinning of the retina and retinal, pigment epithelium in the region immediately surrounding the optic nerve head. This can be seen in a number of pathologic and benign conditions. In biology, photophobia (adjective: photophobic) refers to negative response to light. Also called "light sensitivity" this is an excessive sensitivity to light and the aversion to sunlight or well-lit places. In ordinary medical terms photophobia is not a morbid fear, but an experience of discomfort or pain to the eyes due to light exposure. May be associated with excessive tearing. There can be many causes including inflammation of the iris or cornea. A condition of "light adaptation" that is used in retinal testing such as the electroretinogram. Light adaptation is accomplished by exposing a patients eyes to diffuse light of moderate intensity several minutes. This can be useful for determining the health of "cones," the fine detail and color perceiving cells in the retina. Partial color deficiency affecting the ability to see the color red. There are three possible color vision deficits: red (protan), green (deutan), and blue (tritan). The suffixes –omaly and –opia indicate partial and complete color vision deficits, respectively. Therefore, a person who has tritanomaly will have a partial blue color vision deficit while a person who has deuteranopia will have a complete green color deficit. An indication of damage to the visual system which is greater on one side than the other. The presence of a relative afferent pupillary defect (RAPD) means that the pupils constrict less when a light is directed into the affected eye than they do when the same light is directed into the normal (or less affected) eye . The presence of an RAPD usually indicates damage to the retina or optic nerve that results in diminished light impulses being transmitted from the eye to the brain on the affected side. 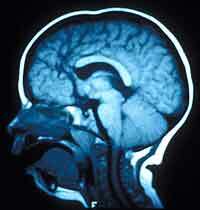 These cells transmit the information from the other layers of the retina to the brain. The axons of these cells make up the optic nerve. Retinal ganglion cells comprise the most superficial cell layer in retina and are susceptible to damage in a number of disease entities, including glaucoma. A group of genetic eye conditions leading to chronic retinal degeneration, accompanied by abnormal deposits of pigment. The disease causes a progressive decrease in peripheral or side vision. Associated with night blindness, loss of peripheral vision, tunnel vision, decreased acuity, lack of depth perception, retinal scarring, and photophobia. An area of partial alteration in the field of vision with partially diminished or entirely degenerated visual acuity which is surrounded by a field of normal vision. A condition of "dark adaptation" that is used in retinal testing such as the electroretinogram. Dark adaptation is accomplished by placing black goggles over the patient's eyes for a predetermined period of time (usually about 30 minutes). This can be useful for determining health of "rods," or the dim light-detecting cells in the retina. A clinically heterogeneous disorder loosely defined by any combination of optic nerve hypoplasia, pituitary gland hypoplasia, and midline abnormalities of the brain, including absence of the corpus callosum and septum pellucidum. A form of color blindness exhibiting loss of the blue receptor, inherited in an autosomal recessive fashion. The idea that individuals with a particular disease process will not each experience the same severity of disease. For instance, one person may have a milder form of the disease while another person with the same disease has a more severe manifestation of the disease. This is in contrast to incomplete penetrance. Devices such as magnifiers and closed circuit television sets that can help people with sub-normal vision see more and function better in day to day activities. Also known as Low Vision aids. Field of vision: The entire area that can be seen when the eye is directed forward, including that which is seen with peripheral vision.